For my monthly maker column in Dutch newspaper “De Volkskrant”, I made a coolbox in which you can control the temperature in three separate compartments to keep craft beer at just the right temperature. 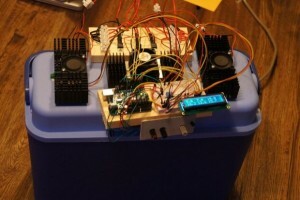 three temperature sensors. I used the often used tmp36 and this instructable assumes you do as well. However, if you have calibrated thermistors, I suggest you use those. Arduino’s and multiple tmp36’s often cause problems with stable temperature measurements that you do not experience when only a single sensor is used on the Arduino.